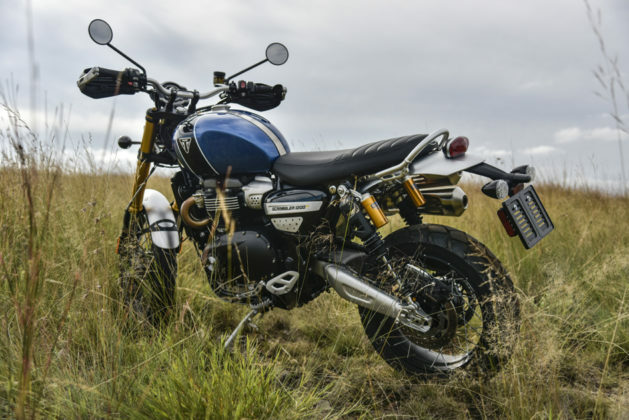 In a weird and wonderful way motorcycling has come full circle with bikes like the new 1200 Scrambler from Triumph. 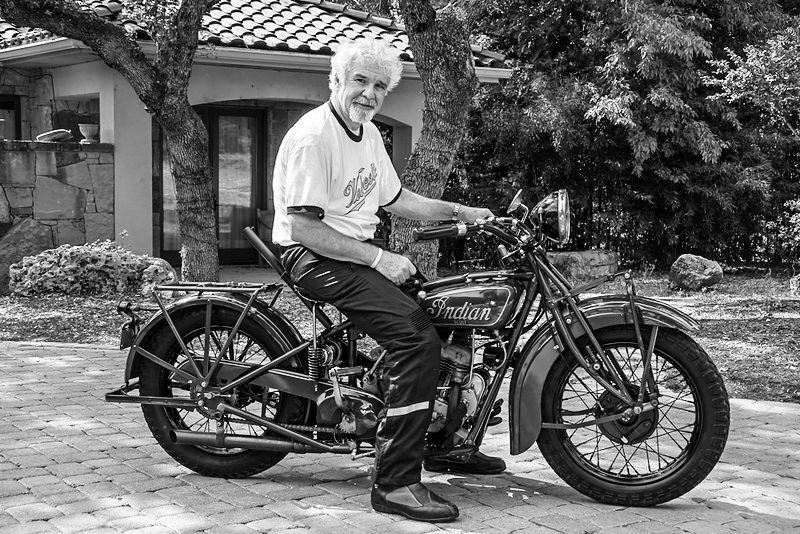 In the dawn of motorcycling bikes were built as utility transport. Cheaper and simpler than a car, they offered the advantages of a horse compared to a horse drawn buggy. Roads were poor, bordering on non existent and bikes could negotiate obstacles more easily than the four wheeled contraptions of that time. For example. A while back I made the acquaintance of an old timer, living in Barberton by the name of Bernie Cook. In the thirties, Bernie made a living by travelling from farm to farm with a steam driven Case threshing machine to thresh maize crops. Small and of slight build, you could still see a latent strength in his wiry frame. Already on the far side of eighty, Bernie’s eyes would twinkle as he recounted tales of those early days in the lowveld. Remember that in those days telecommunications were in there infancy. Bernie could not just respond to a ‘phone call from a farmer to say that his crop was ready for threshing. What he did was way more exciting. Bernie owned an Indian Scout. 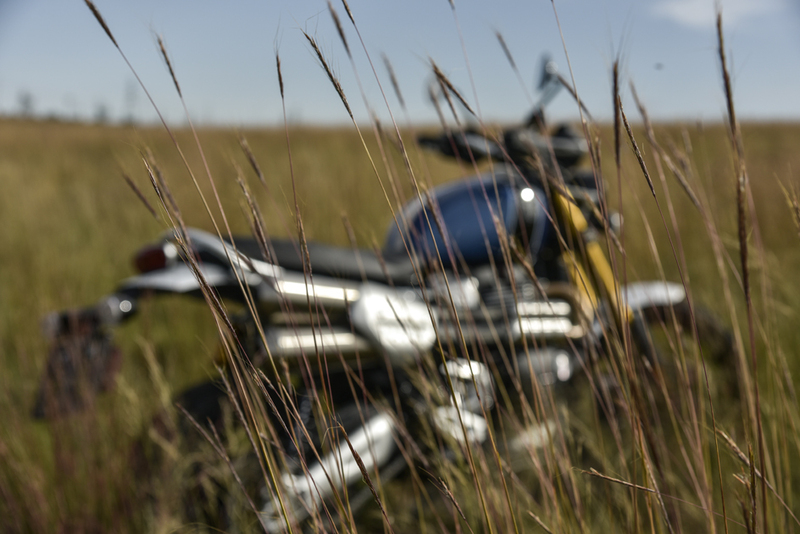 He would fire up the Indian and ride via game paths and dodgy roads and tracks, from farm to farm to assess the readiness of the crop. When he ventured far away he would lash tins of petrol to the Indian and bury them at intervals along his route. This is how he would be able to get back home. 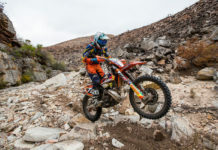 Rivers were another obstacle to be overcome. He would melt candle wax over the electrics to keep them dry, then, by putting a pole through each wheel, he would, with the help of the local “natives”, physically carry the Scout across the river at a shallow point. Incredible! Our adventure riding exploits pale into insignificance when we think of what Bernie did in the course of a normal day’s work. After assessing the crop he would retrace his steps on the Scout, hitch his team of oxen to his Case threshing machine and trek to get the job done. Horse sickness was rife in the lowveld at that time and travelling by Scout negated the problem of being left stranded in the wilderness. [it says reams for the basic reliability of those old bikes]. So why am I telling you all this? Because it’s a flippen’ cool story, that’s why! There is another reason of course. 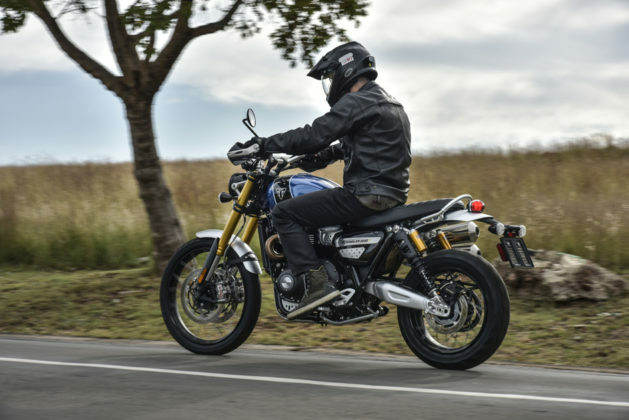 In an obscure way Triumph’s new 1200 Scrambler reminds me of that simple but functional Indian Scout. So much so that I laid down my own hard earned loot and bought one for myself. 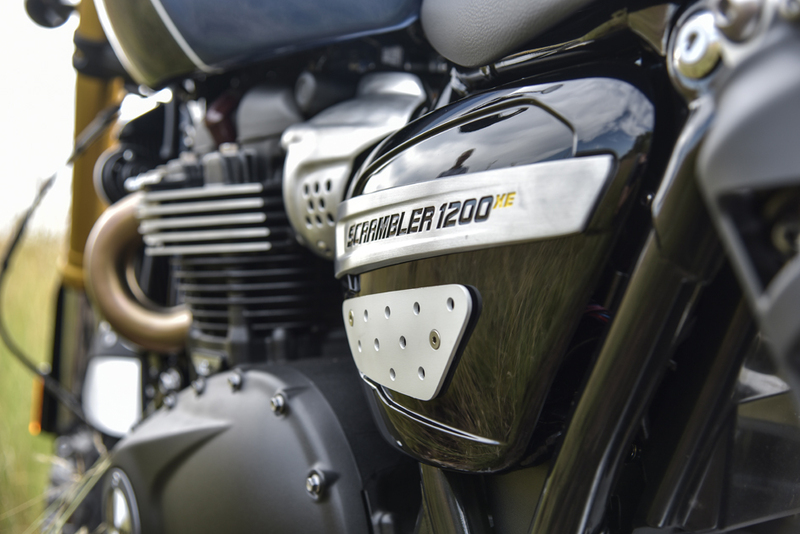 Bikers have evolved into a type of sub culture over the years. We ride for myriads of reasons, many of which relate more to the statement we make with the bike we ride, than using our bikes like old Bernie used his Scout. His Scout was a tool. A means to an end, yet, in the course of utilising the Indian as an essential part of his life, he developed a deep love for the freedom that his simple old Scout offered. That essential simplicity and purity of purpose is what endears me to the Triumph Scrambler. Take a step back and look the bike over. It is not wrapped in a bling cocoon of plastic. It is still “an iron”. Old uncle Bernie would recognize it as kin to his old Scout. 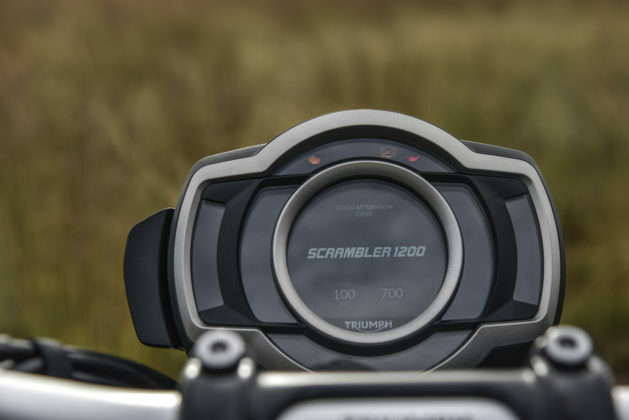 From front to back all the Scramblers considerable talents are laid bare. 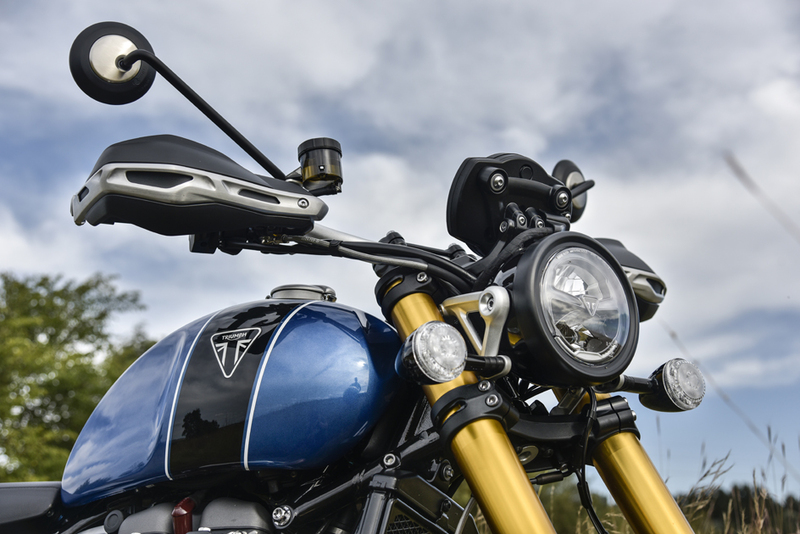 As you sweep your gaze over the Triumph you are struck by how tall it is. 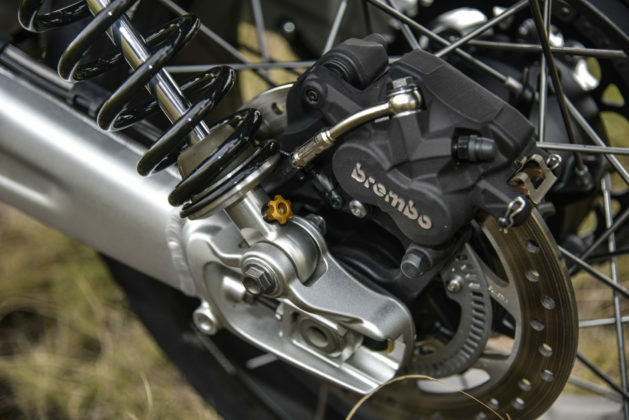 It has ground clearance for Africa and huge suspension travel. 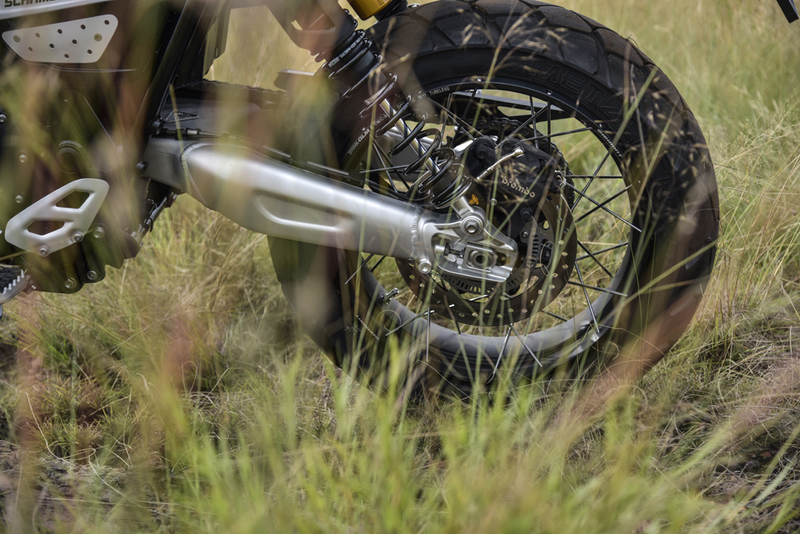 A full 250mm front and rear. 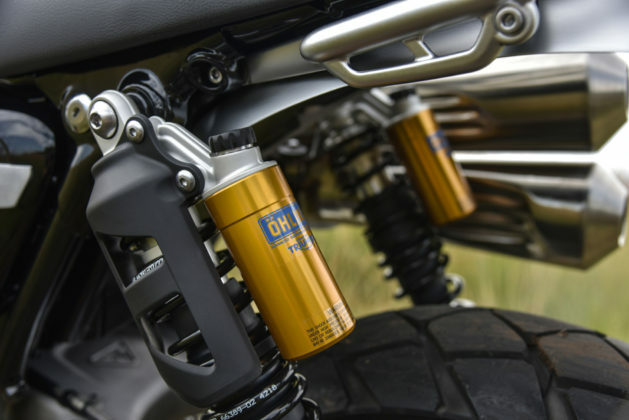 Talking of rear, the twin OHLINS shocks are things of rare beauty to the eye of any petrol head. Gold piggyback remote reservoirs hunch over a shock and spring with what looks like a yard of travel. 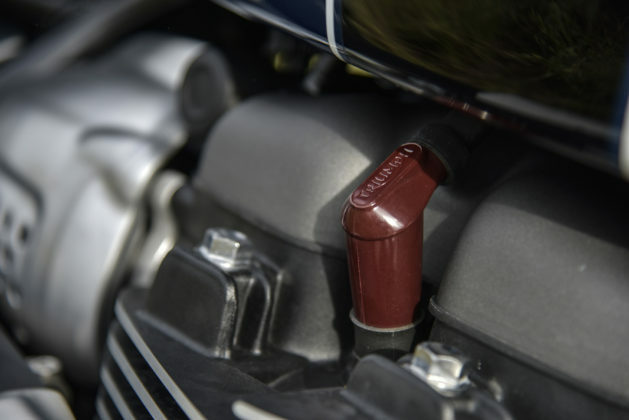 Jewel like compression and rebound damping knobs adorn either end. 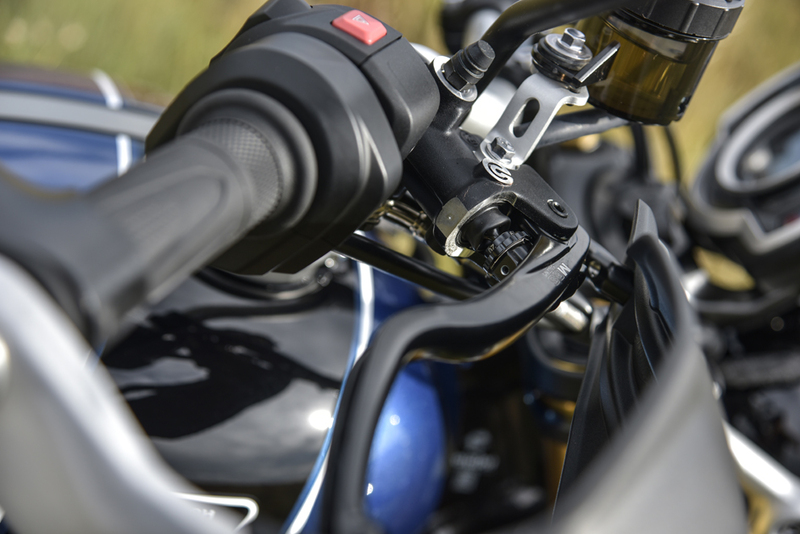 The OHLINS mount at the back of a trick looking alloy swingarm. The rear passenger footpegs are removable at the frame as on the Street Scrambler. 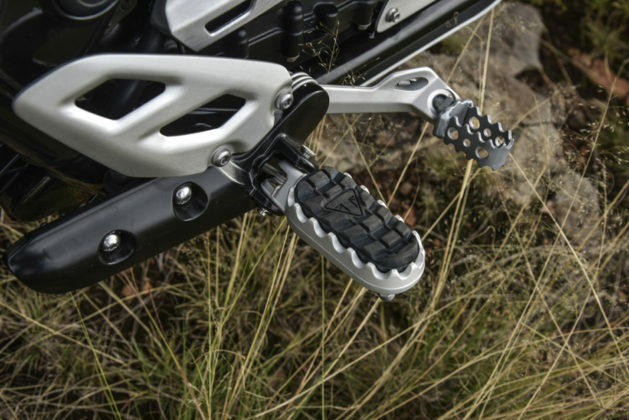 Whip them off and you have an unimpeded view of the back suspension setup. Stunning! 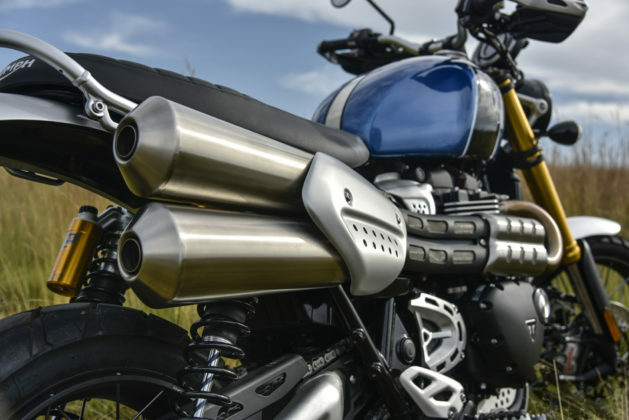 In typical Scrambler fashion the exhausts sweep up and along the right side of the bike, culminating in twin classic reverse cone mufflers. They are tucked in tight with heat shields in aluminium and black protecting your right leg from excess exhaust heat which is only felt in heavy traffic, or at standstill. 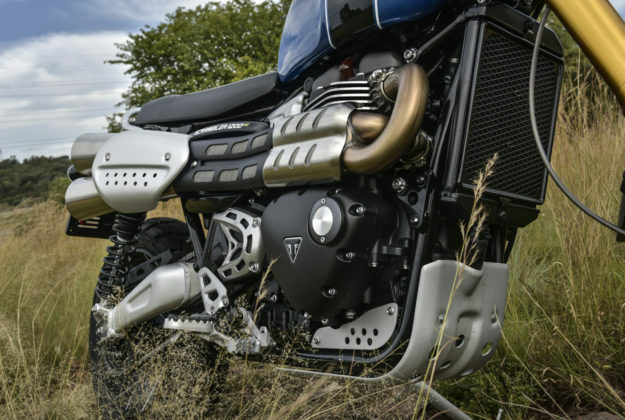 The tank is unmistakeably Triumph Bonnie inspired but a thing of beauty in it’s own right. 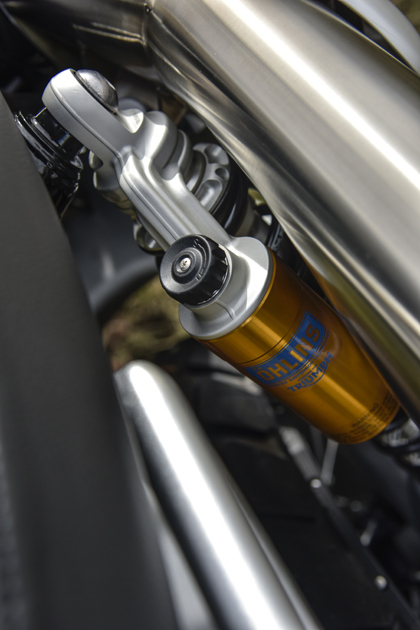 Seamless, with indentations in the front to allow full handlebar lock, it is retained by a stainless steel strap in a shallow channel running the length of the tank. Ubercool! The brushed aluminium filler cap pops open to reveal a lockable inner cap. Kudos to the stylists! 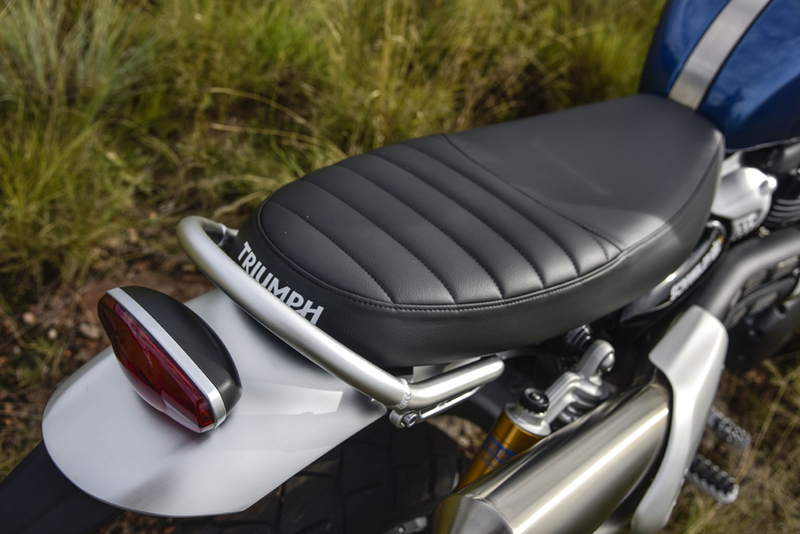 The seat too, is classic Scrambler, long slim and flat. It is firm yet comfy and easily allows back and forth movement for weight transfer as you attack the dirt. 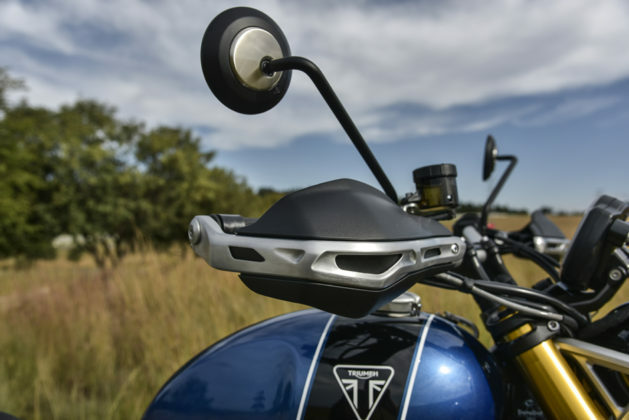 The bars are tall and wide on a high riser type mount that reeks of dirtbike. 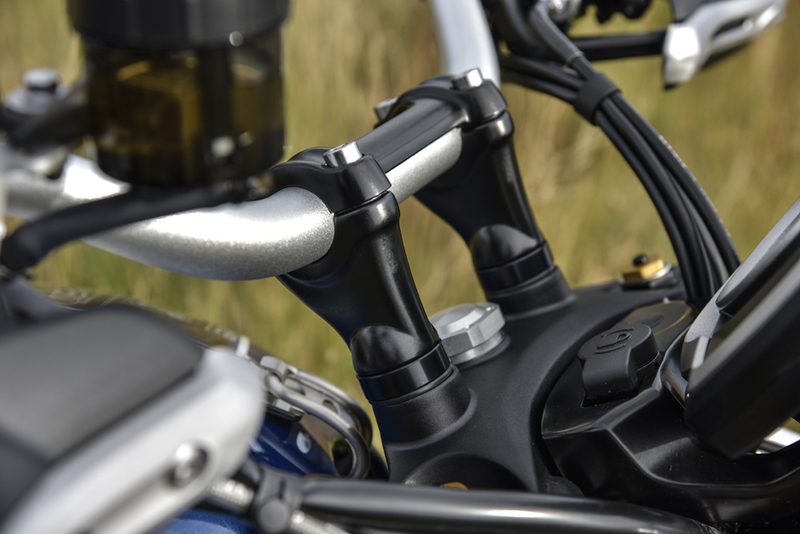 Pukka alloy reinforced handguards are both functional and handsome. 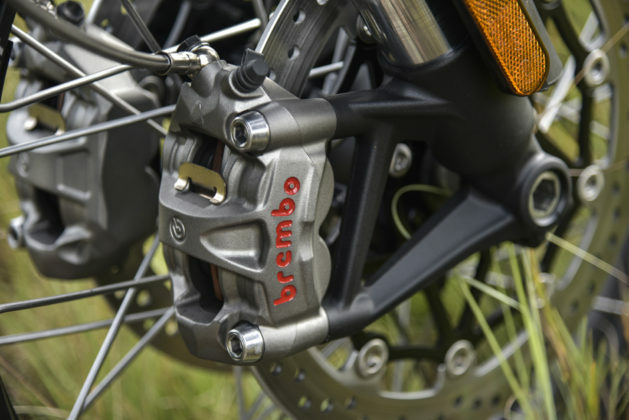 Brakes are Brembo M50 callipers biting on twin discs up front and a single disc on the rear. In a way this epitomises the build philosophy of the entire bike. It absolutely drips quality! 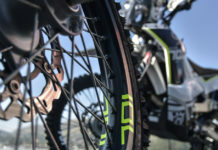 Tubeless outwardly laced Akront rims are 17 inch at the back and 21 inch in front. 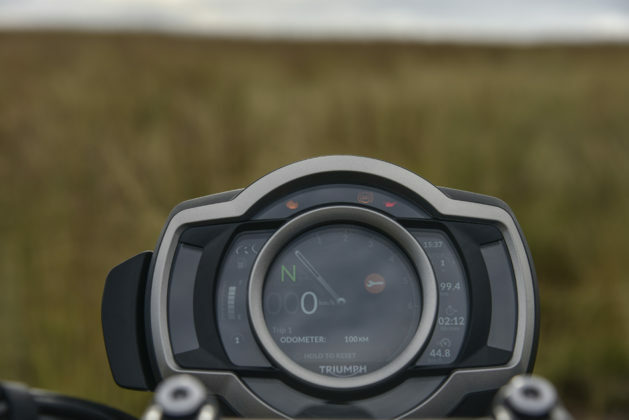 The TFT display is ingenious. Technology at it’s cleverest. It tells you everything you want to know and then some. Programmable, it even greets you by name when you light it up with the starter inclusive kill switch, activated from the keyless entry fob in your pocket. I could have done without that personally but welcome to the modern world Dave. I will have to just learn to trust it, but the day it refuses to greet me and gives me a blank stare, is the day that the limey engineer who’s brainchild the keyless entry was, will get a monumental cramp, which I will wish upon him, in his fundamental orifice! The motor, oh Lordy, the motor. It is truly a magnificent lump. 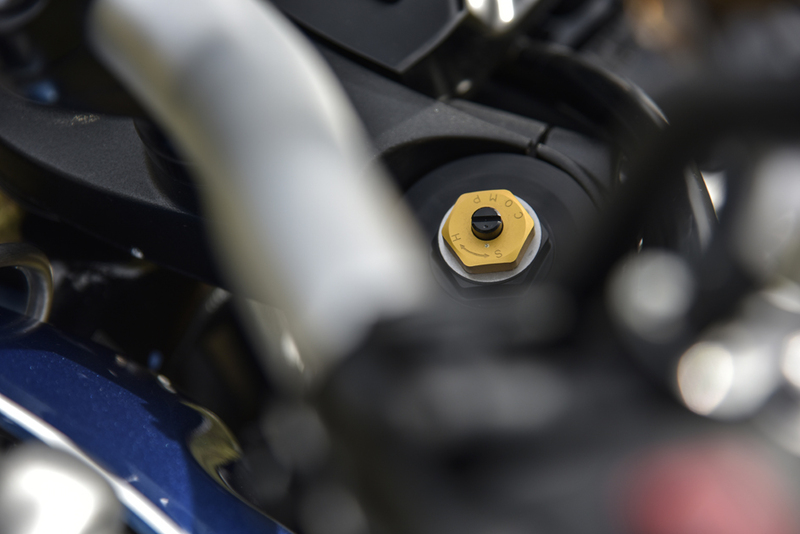 Peak torque is at a mere 3950 rpm, at which point it is producing a twisting force of 110 Nm. BMW’s torque monster 1200 GS LC pumps out a massive 125Nm, but it has to spin to 7000 rpm to do it. The instant hit from low on the XE is unnerving till you get used to it. I find myself short shifting at 3000 rpm and just surfing that delicious wave of stump pulling torque. This is why the motor has this amazing mellow feeling of power that you can never get tired of. It spins up to 90 odd horsepower, but with that torque, who the hell cares? In theory it is geared for about 250 kph at redline in 6th, meaning that at a 140 to 150 practical cruising speed it is smooth and totally unfussed. It is a naked bike after all. The quality of the suspension makes it’s presence felt from the moment the XE starts rolling. 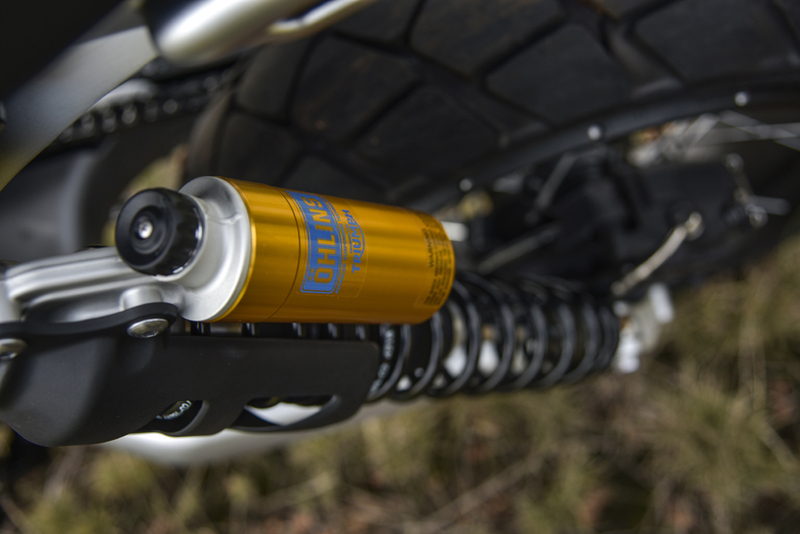 The OHLINS are matched for quality by the big piston Showa USD forks. “Watch that speed bump!, “what speed bump”?. They really are that good. Despite the huge travel, the bike is taught and composed at all speeds and over any surface. It actually feels like a big, really sorted Motard. 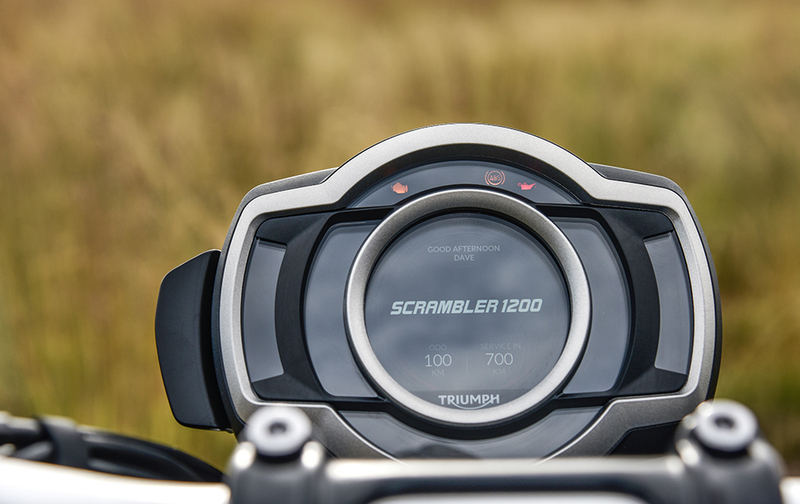 Agile, nimble and punchy. Combine those three attributes in one package and you have the recipe for HUGE fun. 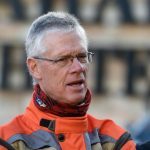 I have not ridden my Scrambler in the dirt as yet, however Spurgeon Dunbar, from Revzilla in the USA, who owns a KTM 1090 Adventure R, is of the opinion, having ridden the XE in the dirt, that it is at least as good, if not better than his KTM! That, my friends is worthy praise indeed. 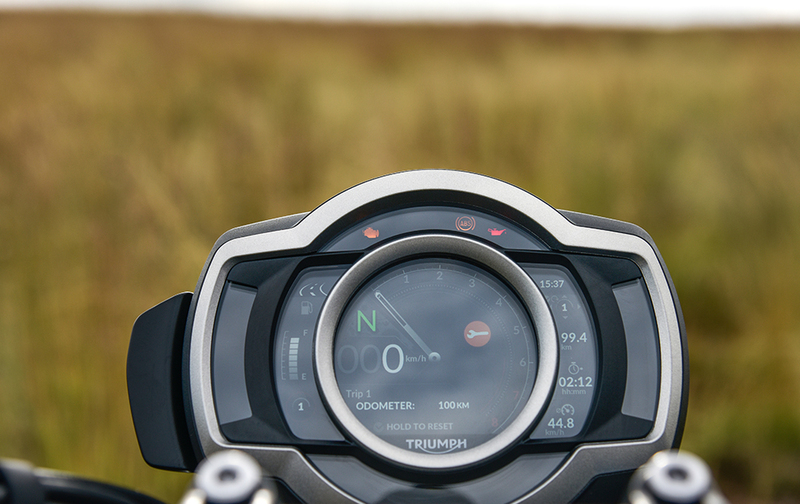 For the record, the Triumph is about 10 kg’s lighter than the KTM, fully fueled. 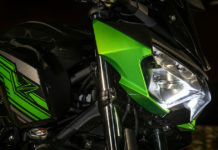 Some folks out there have a “diss response” to any bike that is different and does not conform to an established norm. They think that if a bike is not orange it is not dirt worthy. Well, sorry for you, dude. Your bubble is about to be burst and I think it’s an egg bubble, which you are going to be wearing all over your face. What Triumph has built with the Scrambler 1200 XE is something fresh. 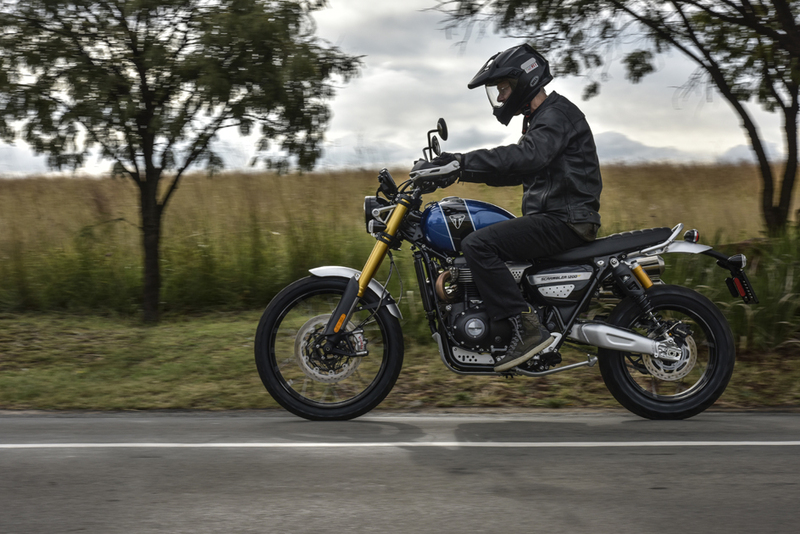 A bike that stirs the nostalgia part of your soul, yet not at the cost of function and excitement. They have crammed the best and latest technology into a simple package. That, in itself, is an incredible and fiendishly clever feat! 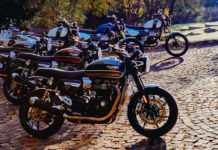 Triumph offer a wide range of accessories for their Modern Classic range and for the Scrambler 1200 in particular. 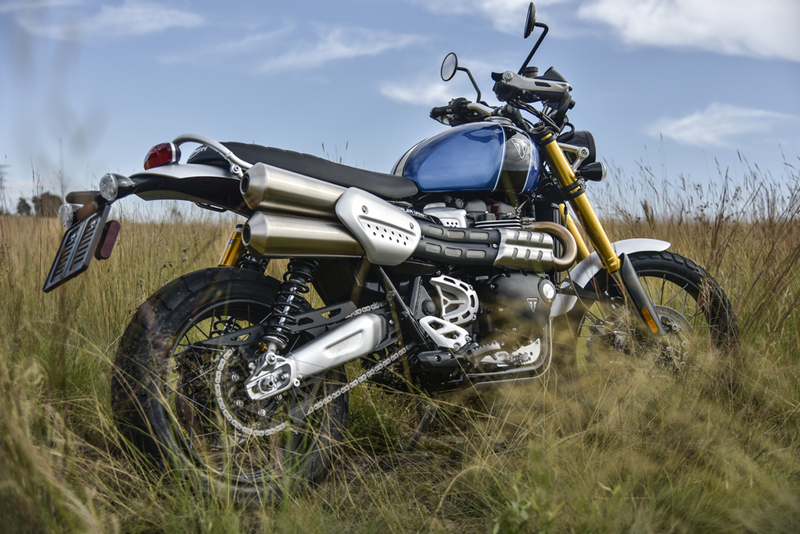 To me, this is a bike for all seasons. Brilliant to use day to day without any significant vices. Fantastic to ride on tar as well as to rip up the dirt. Comfortable and beautiful to behold. 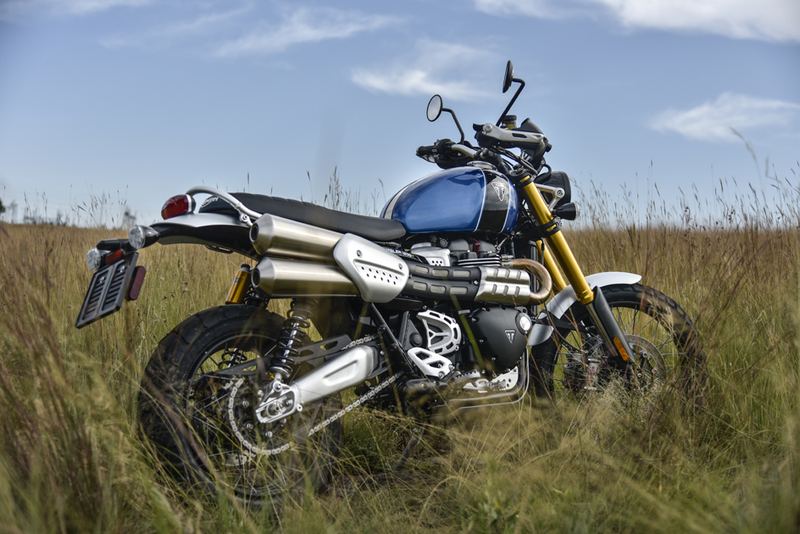 At a current retail price of R205000, It makes a compelling statement. 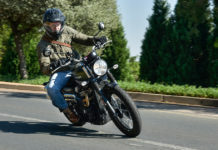 Get yourself down to TRIUMPH in Sandton and ride the new Scrambler. It will blow you away.